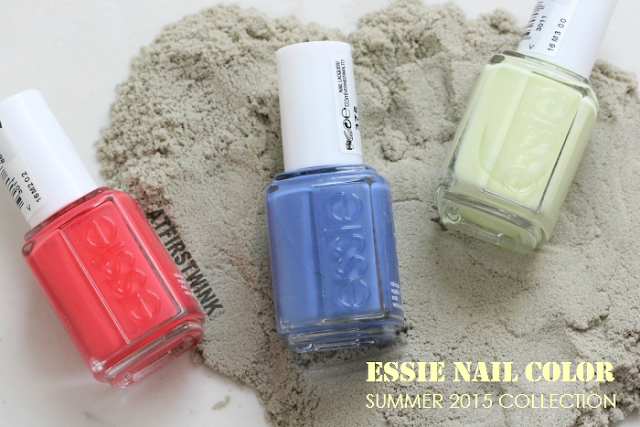 From the Essie Summer 2015 collection, I have the sunset sneaks, pret-a-surfer, and chillato, which are three beautiful summer nail polish shades. I think this is one of the rare occasions that I actually like the wide brush of a nail polish. It applies smoothly and I barely made any mistakes during application. This nail polish looks coral-pink in the bottle, but it is a more orange-red shade on the nails. I prefer to see more pink hues in it, but it is still a very pretty summer color. This is the perfect neon shade for when you think neon is too neon. Chillato is an almost pastel, neon yellow shade with a bit of a green hue. However, it is a bit streaky, so I needed to apply 3-4 coats. This nail polish has the best coverage out of the three nail polishes. After just one coat, it is already really pretty. But just for the pictures, I applied two coats. The color is a bit darker blue than in the pictures. It actually reminds me a bit of the blue of denim, so I think it would look great matched with a pair of denim shorts in the summer. My favorite is the chillato, as I always wanted to add a neon nail polish shade to my collection and I finally got one that is a rather subtle version too (quite rare!). It is too bad that it requires me a bit more layers and patience than normal, but I can overlook that. Overall, these Essie nail polishes lasted on my nails for a week and it kept staying glossy. Somehow, I also don't have the "heavy" feeling on my nails on the first day anymore, which I did have with the first Essie nail polish that I owned.